Discussion in 'Gear & Equipment' started by broj15, May 8, 2014. Boss DD-20 - I've read that you basically HAVE to get the Boss brand PSA 120s adapter because, according to what I've read on line, off brand or just regular 9v adapters are known to .... with the "time chip" of digital delay pedals. Has anyone here experienced this before? also any foot switch recommendations for the tap tempo function. I know the Boss FS-5U is the common standard but I'm open to alternatives. MXR 10 graphic EQ - So, those of you who saw my NAD thread (http://www.sevenstring.org/forum/ge...-something-different-edition.html#post4022037) you might remember me complaining about the shared EQ so I decided to buy a EQ pedal. Now, ideally, I would turn on the EQ at the same time as I switch from Clean to Drive and would bypass the amps EQ and my sound just be based off of what the MXR EQ was dialed to. Would I be correct in thinking that achieving this would mean putting it in the effects loop? Or would it work better if I put it in front of the amp, before the DD-20? Can't comment on the MXR, but in regards to the DD-20, I don't believe you NEED the Boss brand adapter. I've had mine for several years, and while I was originally using the Boss adapter, that eventually broke and I replaced it with a cheapo Dunlop and saw no difference. I'm now running it through a Voodoo Labs PP2+, and, again, no difference. I've run my delays (including my high-current Nova delays) off of a third-party power supply for a while now. No problems. At one point, I ran 2 DD-3's and a Super Chorus daisy chained off of one outlet on the power supply, and it ran like a champ. The MXR shapes the tone better when in the loop. I run one on all the time in my FX loop just to tighten and enhance the tone slightly. Congrats on the new pedals! I was very set on buying a DD20 last weekend, too, but ended up going with the Vox DelayLab. I had a DD20 in the past that I ran off my OneSpot. Didn't experience any issues, at least not that I noticed. My setup was also really quiet. If you don't have too many pedals and don't mind separate power supplies, could take the safe route with the Boss but I'm sure you'd be fine either way. Have fun with that thing just don't get too lost in it. Thanks for the advice everyone. Well as far as the DD20 is concerned I had kind of assumed the rumors were just Boss trying to get people to spend more money, but I wanted to ask a trusted source before I did anything i shouldn't have. Initial impressions are good. There's so many options (some less obvious than others, like the rate/depth control for the modular delay) that it will take me a while before I really get a feel for it. After that happens I'll probably get an analog delay of some sort (mxd carbon copy maybe? I'm open to suggestions) because I can tell the 100 milliseconds for the Dual delay setting is too limiting. As far as the MXR goes I haven't even gotten a chance to try it out yet because apparently and 18v adapter is harder to come by than you would think. I'll probably have to order one. I would consider buying a third party power supply to power all your pedals. Cioks ( Cioks - POWER SUPPLIES FOR EFFECT PEDALS ) makes great power supplies that can run pretty much any pedal. You would want to buy something from the "professional" section such as the DC-10. I just use a 1spot to power my RE-20 (the most comparable thing to the DD-20) and I don't get any extra noise as long as I don't daisy chain it with anything else. 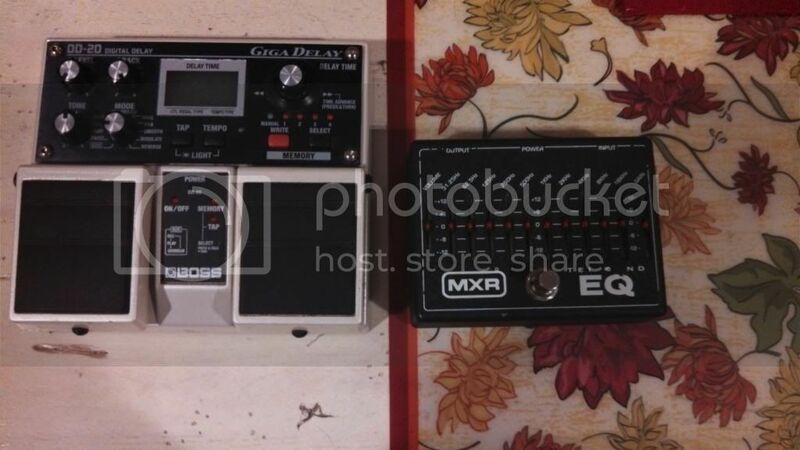 So I use one 1spot for the delay and another one with a daisy chain for everything else. Works pretty well. Yes ,when I got my mxr eq,went and bought a radio shak 18v and nothing but hum,turned out I needed a center negative 18v.